As a Design team member our brief was to create a layout about Weather I chose a Summer /Beachy scene . I had fun with all this texture . Gesso, muslin , shells, chippies and paint. My layout is created on the 7Dots Studio paper /Dreamer collection. Perfect texture for a summer beachy theme. The Australian beach with beautiful soft silky white sands and clear blue ocean, is a fave place we have family fun with our Grand daughter . I added texture and elements to mimic the beach . The hexagon shapes represent the sand castles Ella loves to build. 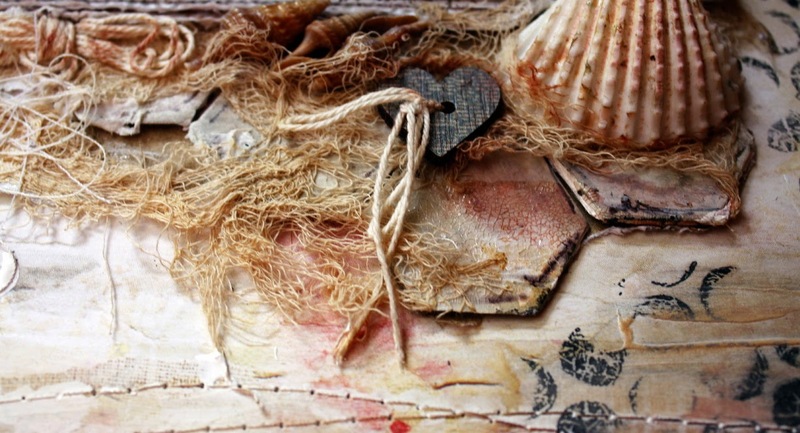 The tiny shells are placed among the muslin which represents seaweed. The wooden heart is a symbol of the love Ella has for the beach. My color scheme is white washed /monochromatic with the contrast of pink and yellow in the photo . Prima – Printery collection, 7 Dots Studio – Dreamer collection, MaJa designs – Vintage Summer Basics. Tim Holtz - metal name plate , Prima - wooden heart ,Green Tara -beige roses, Prima - Metal number , Vintage charms – Brads, 2Crafty –chipboard/hexagon shapes. Hero Arts -Treasure , .Hero arts – circle dots, Kaisercraft acrylic stamp – bubbles, Prima acrylic-trellis . 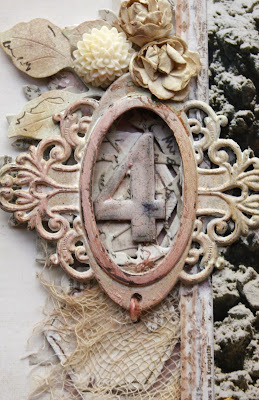 Muslin- tea dyed, shells –found item , versa color ink – black/rose/Khaki, Cottage cutz-leafy foliage, Golden - White gesso , memory box die cut – Arboscello Tree , Tim Holtz clear crackle paint . Oh how lovely! 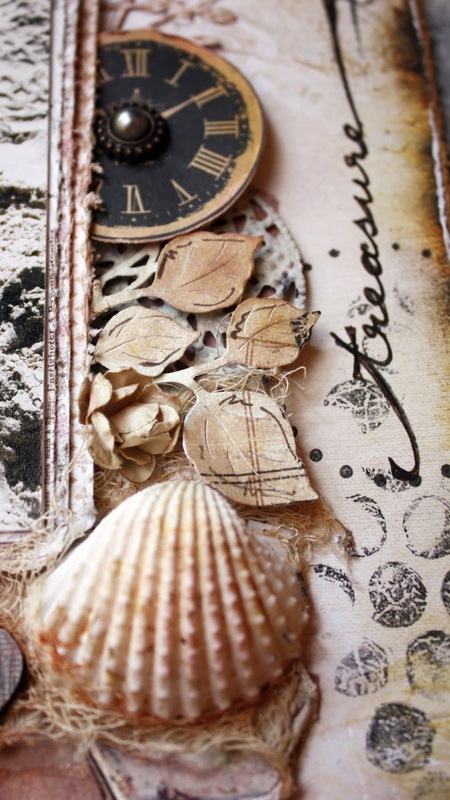 your beachy themed layout is superb! love the netting and your big shell leaves not doubt this feels like it is at the beach.. love it! Gorgeous! Love how the colours of the LO pick up the colours in the photo so well making for a really unified design. The shells are a great addition too! A beautiful layout, that picture is great!! This is just stunning - beautifully done! Congrats on the pub! This is gorgeous!! I love love love the photo, the colors and that shell!!!!!! huge congrats - gorgeous lo! Big congrats on the publication! Your lay-out is out of this world gorgeous :) I love all the beach treasures that you incorporated! Congrats on your publication. Your project is just a fabulous. I love all the beach elements.